In 1999, John F. Kennedy, Jr. took off from Essex, NJ, in his private plane, headed to Martha’s Vineyard. An hour and a half later, he along with his wife and sister-in-law perished in a tragic ocean crash. Come to find out, many people have died in the same way. Outside of mechanical failure, it’s one of the major reasons for flight-related deaths. Approximately 40% of the NTSB fatal general aviation accidents fall into this same category. Remember the old phrase “what you don’t know won’t kill you”? This phrase does NOT apply to life, leadership, and flying a plane. Leading blind simply guarantees an inevitable crash. The penalty of a leadership crash is always deeper, broader, and cost more than we realize. To be an effective leader, we must recognize that leading blind exists and can be deadly. Did you catch that? Eighty percent of pilots DON’T have instrument ratings. Ironically, I would say that most leaders don’t have leadership training. Without training, we won’t be the great leaders our family, business, and organization’s need. We can’t just fake it until we make it. When we fail to take advantage of the instruments, devastating things take place. It is essential that we read, study, and work with experienced leaders to develop the skills we need. Doing this will grow our leadership and teach us leadership navigation, which in turn will prevent us from crashing our families, businesses, and organizations into the ground. We must recognize that our ill-informed instincts can be wrong, and we can’t be complacent. We must be willing to follow the instruments. For leaders, the key instrument is character. It is the foundation on which leadership is built. Without it, one’s leadership is built on sand. Character is often referred to as our personal compass. When we can’t see because things are cloudy and dark, our character points the way. The key is to recognize that leading blind invites disaster, which makes it essential that we take the time to learn how to be great leaders and lifelong students of leadership. Most importantly, understand that our character is the foundation of leadership. Character is what everything else is built upon. At that point, our leadership will be instrument tested and proven capable. 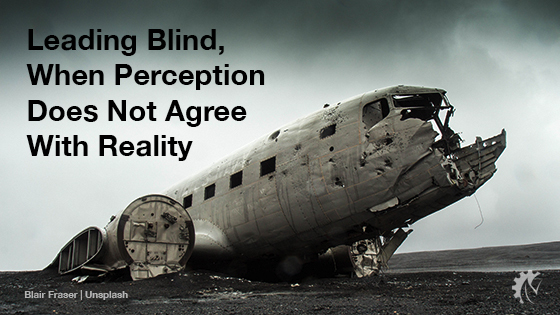 Here is a video that vividly illustrates what happens when a pilot is flying blind.